In 1887 the citizens of the small community on the Shuswap River in south central British Columbia began to debate in earnest the name of their town. It was not a matter of not having a name; indeed, it was a problem of having too many names. The first white settlers called the area Fortune's Landing: Fortune's place where the steamboat landed. Since Mr. Fortune was the first person to pre-empt land on the river, the steamboat stopped at his farm. The area continued to be known as Fortune's Landing until the brothers Thomas and Robert Lambly built a large freight warehouse just a mile north of Mr. Fortune's farm in 1876. It was located on the west side of the riverbank. Since the steamboat now stopped at the warehouse, the area became known as Lambly's Landing. The Lambly brothers were entrepreneurs. 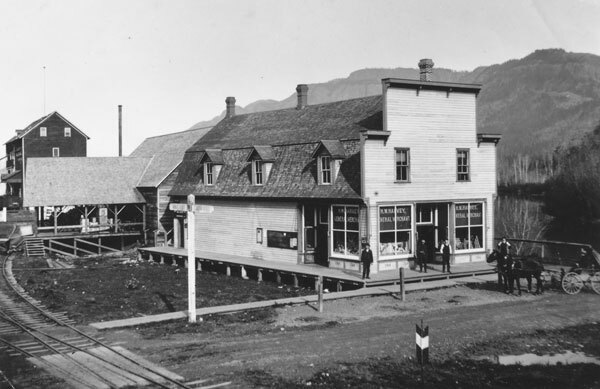 They recognized the potential of the area as the perfect location to develop a terminal for the shipment of goods to the settlers in the Okanagan valley. They pre-empted the land to the west of their warehouse and began to lay out a townsite. Perhaps it was then that they discovered that their warehouse was located on a Government Reserve that was connected at its southern extremity with the Spallumcheen Indian Band Reserve. More likely, they were aware of the problem, as Thomas Lambly was the Government Agent until 1884. The provincial government had designated Lambly's townsite Belvidere. In 1885 they sent Walter Dewdney to survey the Government Reserve into .7 acre lots for the purpose of including them into the larger townsite. The Lambly brothers purchased all the lots save one which was purchased by their brother-in-law, Mr. Postill. The government had dubbed the new town Belvidere, but local residents continued to call the place Lambly's Landing or more generally, Steamboat Landing. The debate on a name for the town was begun in earnest in the spring of 1887, once it had become clear that a Post Office was going to be located in Mr. Harvey's General Store near the Lambly warehouse. What name would appear on the stamp? In June 1887, Mrs. Harvey, as was her wont, joined with other ladies from the town at a literary gathering at the home of Mrs. Lawes. 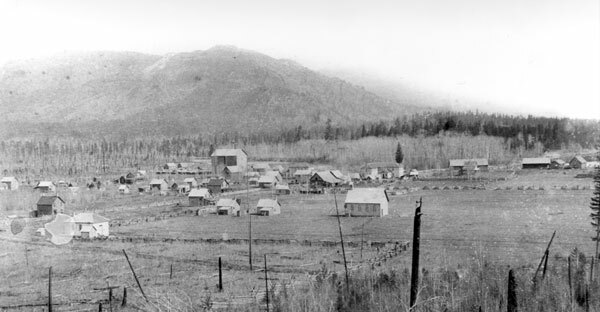 The Lawes' house was located on the hill to the west of the town and offered a panoramic view of the Shuswap River valley to the east, the large bend where the river changed its course from west to north, and in the foreground, the flourishing townsite. On that day the river was at flood. High water time on the river was an annual event. It was then that the miles of snow pack previously locked high in the Monashee Mountains became acres of raging brown water. The flow would eventually peak, and recede gradually, but until that moment no one could predict accurately how high the water would go. From the Lawes' house, the ladies looked down on the river spilling over its banks, and wondered if it would flow into Mr. Harvey's General Store, the Lambly warehouse, or Mr. Lawes' newly built grist mill. As these thoughts were verbalized at the gathering, Mrs. Oliver volunteered a poem to the group entitled "High Tide on the Coast of Lincolnshire" by Jean Ingelow. The assembly listened with increasing attentiveness as the poem described the great peril awaiting the unsuspecting citizenry from a monster tide of water. The only advanced notice of the danger was the chiming of the Boston church bells, which in such times of danger rang a certain tune: "What danger lowers by land or sea? They ring the tune of Enderby." The ladies could be forgiven in their excitement as they recognized the same danger that threatened in the poem was the same that threatened their homes. The tune, "The Brides of Enderby," was the music that saved the people in Lincolnshire. Why not invoke the same tune to save their homes? In fact, why not call their new town: Enderby? 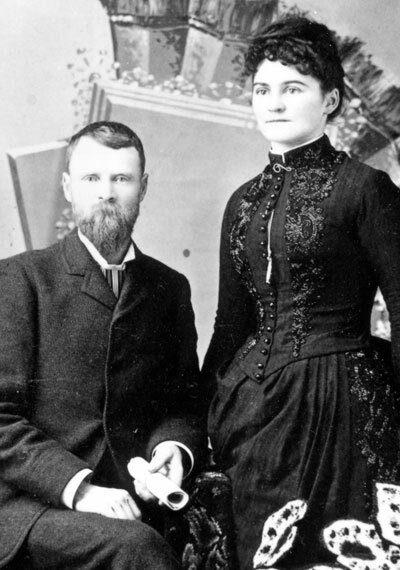 The consensus of the women present that fateful afternoon with the emotion of the poem in their ears and the surging waters of the Shuswap before their eyes was that Enderby was a marvelous name for their town. Since these women represented if not plurality of the town, at least its better half, the name Enderby prevailed. When Mr. Harvey opened the Post Office in November "...some of those who had not been present at this literary meeting naturally inquired where the name came from, what it meant, and who suggested it. We were told to read Jean Ingelow's poem 'High Tide on the Coast of Lincolnshire' and we should then know all about it." Clearly not everyone was aware of the name change until they collected their mail that month, and not everyone was pleased with the choice: "When a name was being sought for the town, Aholo was suggested, as well as Enderby. This would have been a good name, being the name of the Indian Chief on the Reservation near Enderby, but since they had to go out of the valley for a name, they could not have done better than Enderby. It compares favourably with such stupidities as Eldorado, New Westminster, etc." Years later, long after the river receded, the dust settled, and tempers cooled, some of the local citizenry wanted to find out more about the name Enderby, and the poem. They wrote to England and learned that indeed there were three small villages between Spilbury and Horncastle: Bag Enderby, Mavis Enderby, and Wood Enderby. "There is no post office and railway station in any of the three villages; it is therefore no wonder that we failed to locate the name when poring over long lists of English post offices and English railway stations." As these concerned citizens continued their inquiries: "We sometimes wondered too, on reading the poem why the people of Boston selected this particular tune, and what sort of dames these ladies were, these Brides of Enderby, whose grace and beauty were celebrated in song and later on-when people knew more about them, no doubt-mean, when they heard the tune turned pale and shook with fear. It appears now however that they, like the Furies and Mrs. Gamp's friend, Mrs. Harris, are purely mythical." While the event described in the poem actually occurred in 1571, Jean Ingelow had exercised her poetic license and created the story of the bells and the tune, "The Brides of Enderby." One of their English inquiries revealed that perhaps a tune had been created to suit the words in the poem, but that they had never been played on the bells of Boston Church. Without a plebiscite, the debate on the name of the small town on the Shuswap River was resolved at a ladies' literary gathering, but had it not been for Jean Ingelow's imagination, Mrs. Oliver's fortuitous recital, or Mrs. Harvey's relationship to the Post Office, the little town might today be called Lambly's Landing or Aholo.